Alexandria Giardino is a writer and translator. Her work includes translating My Life with Pablo Neruda by Matilde Urrutia and her essays have appeared in the Village Voice Literary Supplement, Marie Claire, Discover, American Poetry Review, and on air at KQED. Giardino lives with her family in Northern California. Ode to an Onion is her first children’s book. Felicita Sala is the illustrator of several picture books. Sala lives in Rome with her family. "Onionskin endpapers are a nice touch to an introduction to the Chilean poet who paid tribute to familiar objects." "Sala's exuberant illustrations are playful and colorful . . . a sweet story about the creative process." 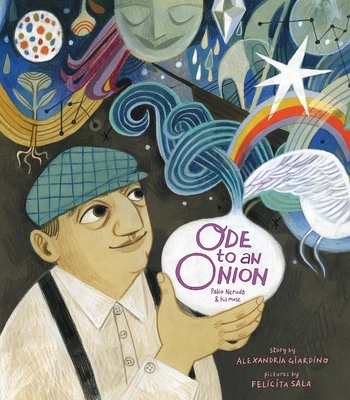 "Children who love words should warm to Alexandria Giardino's ODE TO AN ONION: Pablo Neruda & His Muse . . . In Felicita Sala’s vivacious and beautifully detailed drawings, done in colored pencil, Mathilde’s smile and Pablo’s glum expression give a tender humor to this real-life relationship." "A handsome book about appreciation." "Gloomy versus hopeful. Therein lies the timeless tension between Nobel Laureate Pablo Neruda and his wife-to-be in this lovingly envisioned and supremely handsome book." "This one is a treat for the eyes and ears."